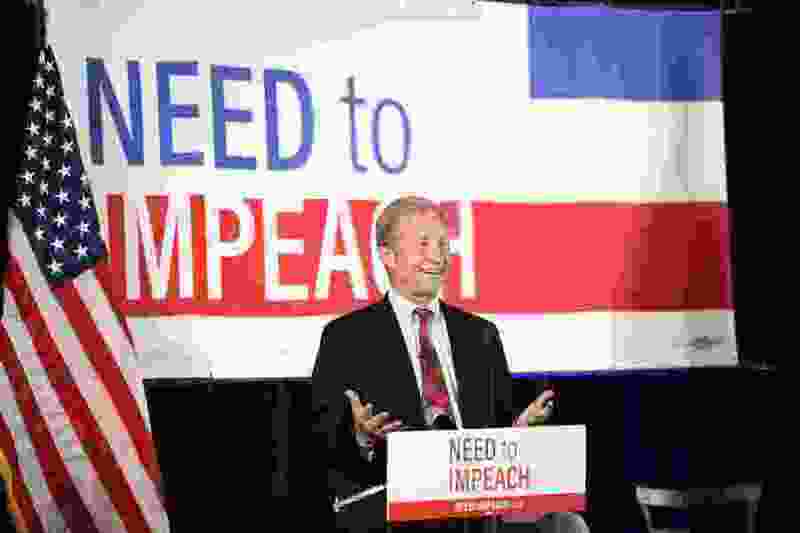 (Courtesy photo) Tom Steyer, a billionaire pushing to impeach President Donald Trump, addresses the public a a Need to Impeach town hall in Des Moines, Iowa, Tuesday May 08, 2018. If you were a billionaire, how would you spend all that money? Tom Steyer has decided to use millions to try to impeach fellow billionaire President Donald Trump. Steyer brought his 30-city tour of town hall meetings to Salt Lake City on Friday — as he also continues nationwide TV ads and donating to groups that offer legal aid to immigrants whose families were separated. He laughs when asked why a billionaire would spend his time pushing to impeach the president. He especially bristles about how Trump has handled immigration. He spoke with The Salt Lake Tribune in advance of a town hall meeting he scheduled for Friday evening at the Falls Event Center at Trolley Square — part of a pledged $40 million effort to seek to oust Trump through his Need to Impeach group. That organization — which Steyer launched in October — has gathered more than 5.4 million signatures in an online petition on its website. Most came in response to TV ads it ran featuring Steyer. (Fox News pulled one of those ads not long after Trump tweeted his displeasure). His drive has attracted plenty of attention in such media as The Nation, Christian Science Monitor and the New Yorker. Steyer said he believes “Washington elites” think it is not time to talk about impeachment because it could divide their parties before midterm congressional elections. Steyer has invited constitutional scholars to weigh in about whether legal standards have been met to impeach Trump, and has posted that online. He argues that has occurred — says impeachable offenses most easy to prove are obstruction of justice and receiving non-allowed payments or favors from foreign governments.